ALESTORM Premiere First Video From Upcoming Album For The Track "Alestorm"
Ahoy! The one and only heavy metal pirates of ALESTORM are back, and they've brought with them their 5th full length album No Grave But The Sea, which is set to be released on May 26th via Napalm Records. Time to put on your eyepatch and let the rum flow freely for the unstoppable international party machine! 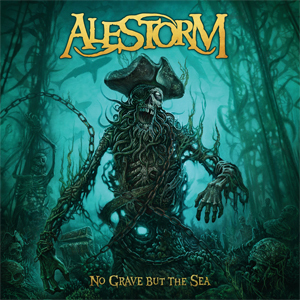 The metal pirates lead by Captain Christopher Bowes have now unleashed a first and official video from their upcoming album No Grave But The Sea, and could not have chosen a better song title to celebrate a pirate's life and tunes than after the band name "Alestorm"! So raise up your tankard into the sky for a brand new and first appetizer of ALESTORM's new album, and watch the video on KNAC.COM right HERE! "A pirate's life is simple: We drink, steal and kill!" Damn right. And no other band in the galaxy creates such epic modern symphonic folk metal anthems with endless hooks that will be stuck in your head until the heat death of the universe. Or in ALESTORM's own words..."Stupid songs about getting drunk and stealing treasure". Twisted together with blistering harmonized guitar & keyboard solos, thunderous power metal majesty, and unrelenting modern metal riffing, No Grave But The Sea is nothing less than the perfect soundtrack to the most epic battle of your life.